What is eVaidyaJi Anti Constipation Capsules? 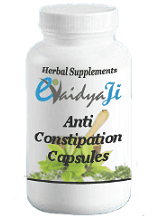 eVaidyaji Anti Constipation capsules are rooted in the ancient practices of Ayurveda. Ayurveda focuses on a person’s constitution. A person can be one of three constitutions, or Doshas, or a combination of the three: Kapha, Vata, and Pitta. These capsules come in 60 or 120-capsule bottles. They aid in the flow of bowel movements and general digestive flow. They calm indigestion, loss of appetite, unsatisfactory bowel movements, flatulence, and belching. The quantities of each of these ingredients are not mentioned, however, there is a detailed description about what each ingredient is designed to help with. A customer should take two capsules with hot water at night. The Anti Constipation capsules come in two different sizes and two different price points. The 60-capsule bottle costs $13.95. The 120-capsule bottle costs $25.11. After investigating the eVaidyaJi website, we could not find any noted side effects. Even when we clicked on the individual ingredients, there were no side effects given. Each herb description went into great detail about the benefits of each in terms of Ayurveda philosophy, but there was nothing about the side effects of each ingredient. The manufacturer’s commitment is found on eVaidyaJi’s Frequently Asked Questions page. The FAQ tab is found at the bottom of the website. The manufacturer’s commitment states that if a customer is unhappy with the products purchased off of the website, they can be returned to eVaidyaJi for a full refund. The customer must pay for shipping the returned items. Once the returned items are received by eVaidyaJi, the refund process will begin. The length of time to see the money back in a customer’s account will depend on the payment method of the original transaction. There is a section on the product website for testimonials, but for the Anti Constipation capsules, there weren’t any listed. When we attempted to research the product on Amazon, we couldn’t find eVaidyaJi’s company or any of its products. eVaidyaJi’s Anti Constipation capsules seem like a very natural remedy for digestive issues. It seems to be important for a customer to have a working knowledge of Ayurveda principles and philosophy before using this product. Also, it seems important to understand Indian herbs and how they impact the body. Since there are no side effects listed for eVaidyaJi’s Anti Constipation capsules, we suggest you consult a physician or Ayurveda specialist before consuming this product. It is also concerning that we could not find any testimonials or ratings for this product on eVaidyaJi’s website. This company might not be as well known in the United States, especially since we could not locate eVaidyaJi or its products on Amazon. While the study of Ayurveda and its principles seems interesting and might be a great way to treat and heal the body, more information should be found out about eVaidyaJi’s Anti Constipation capsules before they are purchased and consumed.